One of the best and tastiest dishes in our range and iconic French dish. 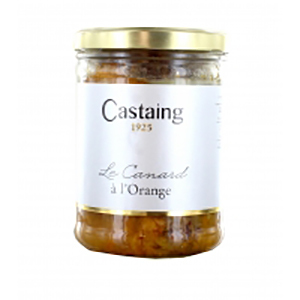 A delicious canard a l’Orange (duck fillet in orange sauce) prepared by Castaing in the Landes region. Simply warm up gently in a saucepan and serves two generously. Goes well with mashed potato to absorb the sauce. And like all the Castaing range, the quality and flavour are outstanding! Storage: 3 years in a cupboard. Once open store in a fridge and use within 3 days.